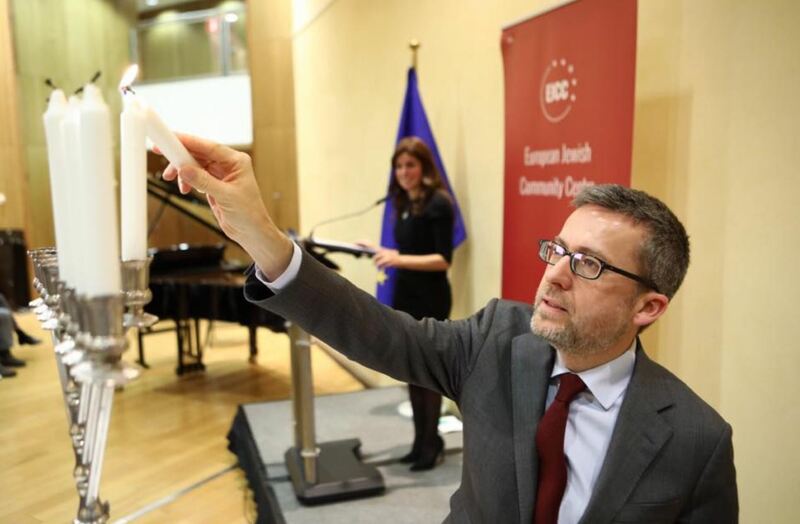 Commissioner Moedas, thank you for hosting Chanukah, having in mind 2 millennia of Jewish culture in Europe, it is very meaningful and symbolic to celebrate here. Today we not only celebrate Chanukah, we also pay tribute to initiatives that bring light, hope and peace. Most notably we celebrate the 70th anniversary of the Human Rights Declaration which marked a turning point across the world. The story of Chanukah is about a group of Jews, the Maccabees, who fought for their religious Freedom and prevailed. The lights are the symbol of their victory. Today these candles continue to be a symbol of the victory of Freedom over oppression. The victory of education over ignorance and the dignity of difference over imposed homogeneity. In the 30s, even before the second war started, that is only 80 years ago, a third European countries imposed racial laws, limiting Jews from exercising their professions, depriving them of their rights and restricting any economic opportunities. It all ended with one of the darkest moments in human history. But even in the worst moments, Jews gathered to kindle these candles, making sure the light of hope will not be extinguished. Not long after that, a project of a peaceful union of nations of Europe was born founded on freedom, prosperity and Human Rights. And in a way the EU became part of the Chanukah miracle: where light dispels darkness. Many would object to this, as we are still far from the perfect story. Migration, Brexit, Eurozone and the meaning of European Identity sill divide Europeans. Racism and anti-Semitism is still a reality in Europe. We are indeed facing many problems. so how do we deal with them? As today we have the honour to be in the presence of the commissioner responsible for research science and innovation, surely there is much we can learn from the huge progress science has made in the last century and the well-being it has brought to our lives. Karl Popper, the famous Science philosopher said that there is no absolute definition of truth, but we do have a clear definition of error. If we want to advance in the pursuit of truth, it is not by quieting critics, but by eliminating errors and criticizing our initial perceptions or theories. After you have eliminated the previous error you are not done and free to rest and enjoy the truth, you will face a bigger problem and new errors to fix. This is, a permanent path to grow and to learn. Science advances by building on errors not by denying their existence. But if we constantly face untruthful bits in our thinking, in the systems we create and the politics we do, what’s the point of all this anyway if absolute truth is unreachable? Popper points out that the new problem is better than the old one and o to of that, it allows us to discover staff we didn’t even look for. We advance from bad problem to better problems and then to even bigger ones. This process of growth demands humility and intellectual honesty to accept that we have yet much to learn and that we ignore more than what we know. As the Mishnah, a central part of Jewish thought, declares: who is a Sage? he who learns from every person. Allow me to extrapolate and go back a second. The EU has many ghosts of the past haunting it, but we can safely say that today’s problems are way better than the problems we faced yesterday. Let me share with you an interesting example that Historian Youval N. Harari raises in his latest book: Many Catalonians demand independence as do many Scots. Other regions across Europe have silent, but similar hopes. It’s an irony isn’t it, that the very stability and protective shell the EU is providing to the union, fosters new waves of nationalism, as today many regions in Europe can dream once again of independence when they don’t have to fear a sudden invasion from any other European nation or a classic political catastrophe that was the bread and butter of Europe not long ago. When the terrible problems of the past are solved, new problems arise but more peaceful. Take in consideration that no war was fought for Brexit. I am a believer of gradualism as it takes on board human nature of gradual growth. What it means is that, it is important to understand where we stand today as a society, but even more significant is the trend we are following. Today’s challenges must be treated with seriousness, but we also need to protect and guarantee the continuity and growth of the milestones that we have achieved until this day. Indeed, that is how we do it on Chanukah, one candle at a time, gradually increasing the positive effect of light. If yesterday, we lit 2 candles it is not enough. Today we will light 3. And tomorrow 4. It is far better to focus on light than on darkness. Darkness does not define us. Our identity cannot be defined by adversity, a union should not persist only based on a common enemy. We can be defined by, the ideals we believe in, a common hope and a vision of a world we want to accomplish together. A world with more respect between the different identities. More education and equal opportunities to the young generation. At any crossroad of life Always choose light. Until the most remote corner of the world will glow, do it like a Maccabee or as in Greek mythology, like Prometheus who brings fire to humans to improve their lives, but do please, share your light. Wish you all a happy holiday and a happy Chanukah.